So, my weight over the past three and a half years has gone between highs around 225 pounds and lows around 216. So, I'm currently as slim as I've been in the past several years. Everything from this point on will be a new low for me this century. Somehow I missed going to the gym this week, but I walked home from work every day but Wednesday. Lunch was the regular healthy fare all week, and I didn't have any donuts -- just one Timbit. Dinners were reasonable, 'cept Tuesday night when we had a special dinner out at Il Mercato on Spring Garden. (Homemade Italian sausage, pan-fried with carmelized onions, with baby carrots, green beans and fantastic potatoes.) Of course, there was cake. 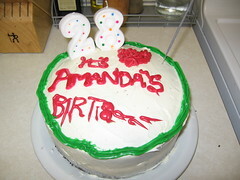 I made a cake for Amanda's birthday on Tuesday (see above), and we ate it. One slice just wasn't enough -- this was goooood cake. Didn't eat it all in one night, but I'll tell ya there's none left today. Pizza one night. Pizza another night (a donair lover's pizza from K.O.D. -- I didn't love it, but I was really hungry Saturday night). Yikes. Zero change this week. I did a whole bunch of free squats on Sunday, leading to sore legs on Monday. But it's the good sore -- that painful, gosh-I-must've-done-some-good, can't-wait-for-that-to-heal-so-that'll-be-stronger kind of pain. This week shapes up to be interesting: recovering from a big Amandariffic turkey dinner on Sunday, but enjoying healthy turkey-spawned leftovers through the week... and a big catered lunch at work Wednesday to celebrate a full year since the station launched. Let's hope for a loss this time next week! Somehow the birthday celebrations turned into a week long event. Don't forget the weekend we had before last when my parents were here - some eating out and of course, donairs (all in the name of introducing same to donair-virgins). Time to buckle down again. Hopefully the superfluous turkey and the re-introduction of the slow cooker into our meal planning will help out during those evenings when I've had a crappy day and just really don't feel like cooking. I too have been at a bit of a weight loss plateau in the past month, but its no wonder when you look at what we've been eating. That's quite the cake ya got there.....and you say you ate that?